Crystal Tower - located off Bukit Timah Road - is being re-launched for en-bloc sale, but at a slightly lower price. The freehold residential site is being offered for en-bloc sale for about $150 million, which translates to $1,458psf ppr. Crystal Tower is a 28-unit, 11-storey residential development that rests on an elevated 60,482sqft site with a gross plot ratio (GPR) of 1.6. A development charge of approximately $5.22 million is payable up to a plot ratio of 1.76, which takes into consideration an additional 10% balcony space. "This compares favourably to the most recent land sale in the vicinity - Nos 2 - 8 Robin Road, which was reported to be sold in December 2011 at a land rate of $1,426psf ppr," said Tang Wei Ling, Colliers International's executive director of investment services. When it was first tendered in July last year, the indicative price was $155 million, or $1,600psf ppr. The tender closes on Feb 27. 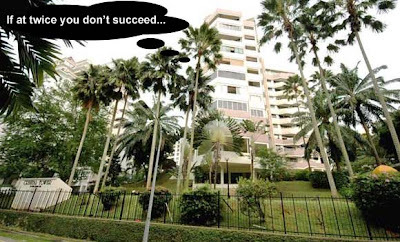 This is the third time Crystal Tower is trying for en-bloc. After the first (failed) attempt in July 2010, another (unsuccessful) attempt was made in October but with no indicative price. So will this be third time lucky? No Comment to " Enbloc News: Crystal Tower...Take 3! "